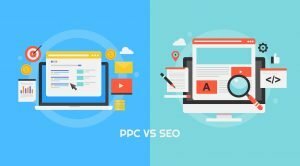 SEO vs PPC: What’s Right for Your Business? As someone who works for a digital marketing agency, we usually create and tailor specific digital strategies for our clients. But, of course, these clients want to know where their money is going and how do they know that this strategy is right for them. SEO or Search Engine Optimization is a digital marketing strategy that focuses on growing visibility organically across different search engines. A lot of factors come into play within this strategy but the catch is, earned placement across search engines means that you don’t have to pay for each time a user clicks on your website. 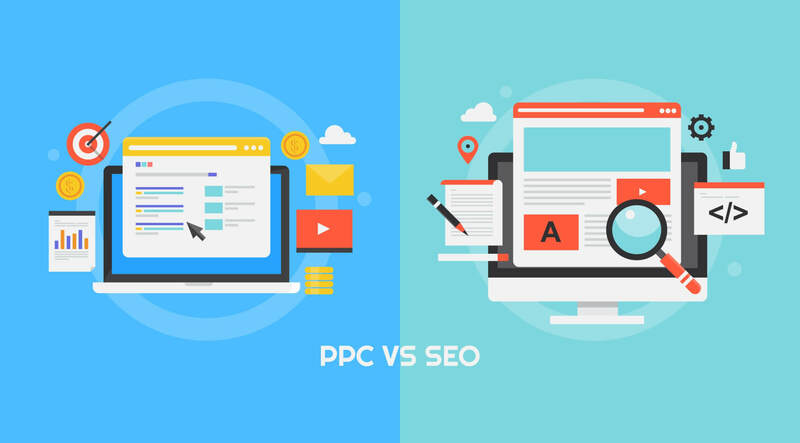 PPC, however, stands for Pay-Per-Click and is another digital marketing strategy in which advertisers pay an amount each time one of their ads is clicked. Basically, you pay the search engine to have users visit your website by placing your ads on the top or bottom of the page to gain more visibility. Most companies are so used to traditional marketing and they expect to get the same fast results with digital marketing. We usually let them know that with SEO, they have to be patient as it is a longer-term process. There is no guaranteed strategy and you have to be flexible enough, depending on the industry, to try out different strategies. A lot of times, a lot of factors need to be improved before you start to get good rankings across search engines and these usually take time. Yet, with PPC, although it is possible to get results tomorrow, you have to ready your wallet for some damage. Below is an example of a Google Search Engine Results Page showing results for the search term “plumbing service”. It also shows SEO results vs PPC results. Using different platforms such as Google’s Keyword Planner, I was able to find out that the search term, plumbing service, costs about $35 per click. 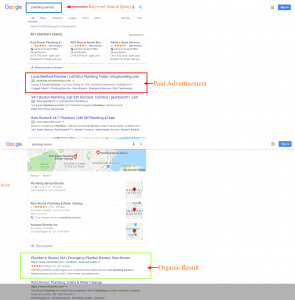 You can differentiate PPC results from organic results by the “Ad” box on the right of the advertisements. Roto-Rooter, although it is paying for advertisements as well, ranks first organically. This means that it is not costing them anything every time someone clicks on its website. Just based on these numbers, SEO, although would take longer, would be a more cost-effective digital marketing strategy. Boston Web Marketing specializes in both digital marketing endeavor. Our team is composed of certified Google Ads specialist and SEO specialists. If you are ever unsure on what strategy is best for your business, we offer free SEO consultation! Call us now and we would be happy to help you out.